Be timeless. The leather Half Hour is the epitome of class and style. An ostrich embossed leather body mixed with a lambskin flap and side panels bring this bag to a whole new level of luxury. 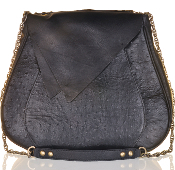 The convertible strap makes this bag easy to wear on your shoulder or cross body. Finding your ID has never been so easy! The wallet flap helps you organize your cards with ease and you'll never lose your keys with the signature key leash. The Half Hour is a bag that will last you a lifetime. Dimensions: 15"W x 13.5"H x 4"D | Handle drop: 15" | Strap drop: 24"